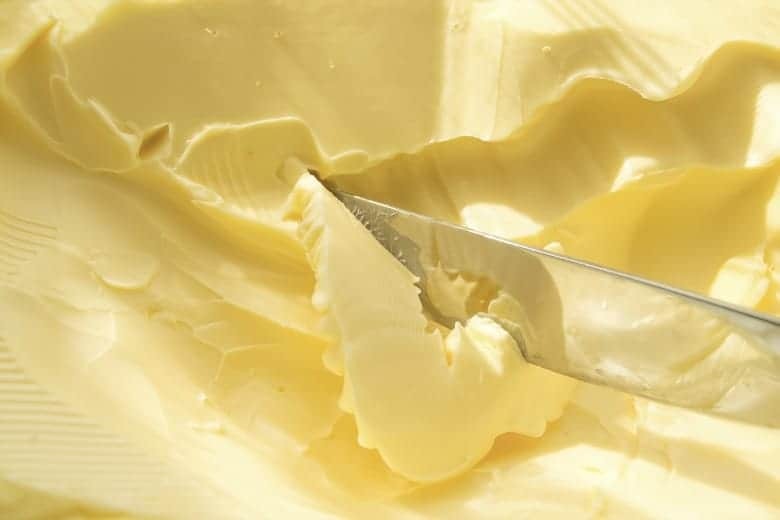 Home » Is Margarine Harmful? – 6 Secrets They Don’t Tell You! Is Margarine Harmful? – 6 Secrets They Don’t Tell You! Is Margarine Harmful? Or, to put it another way, is margarine bad for you? Let’s take a look at what margarine is, the side effects of margarine, and the disadvantages of margarine. My mother had a mild heart attack the week before Thanksgiving and was found to have an 85% blockage in one of her coronary arteries. She was put on a low-fat diet which contained margarine. Is Margarine Good or Bad? What food do you think of as being full fat? For me, it is butter, rich creamy butter. Unfortunately, butter is a big no-no on a heart healthy diet. So, when looking for a “heart healthy” alternative to butter, margarine is recommended – according to the doctors! Margarine was created in 1870 by a Frenchman from Provence, France — Hippolyte Mège-Mouriez — in response to an offer by the Emperor Louis Napoleon III for the production of a satisfactory substitute for butter. He used margaric acid, a fatty acid component isolated in 1813 by Michael Chevreul and named because of the lustrous pearly drops that reminded him of the Greek word for pearl, margarites – and – he claimed the Emperor’s prize. Margarine has had a colorful history to say the least! In fact, at different points in history, 27 states prohibited the manufacture or sale of colored margarine, 24 imposed some kind of consumer tax and 26 required licenses or otherwise restricted margarine sales. But, with advertising and new packaging, it reached consumers who eagerly devoured the fake stuff. 1998 marked the 125th anniversary of the U.S. patent for margarine. Everywhere we turn we hear how good a low-fat diet is for us – from television commercials to the American Heart Association. But, looking at the nation as a whole shows a different picture than what the medical community proports. In the 1960s, fats and oils supplied Americans with about 45 percent of calories – about 13 percent of adults were obese and under 1 percent had type 2 diabetes. Today, Americans take in less fat, getting about 33 percent of calories from fats and oils – yet 34 percent of adults are obese and 11 percent have diabetes, most with type 2 diabetes. It is time to expose the myth that a low-fat diet is good for you! Low-fat is not what the human body needs – In fact it is harmful! Not all fats are created equal as is the case with butter made from the milk of grass fed cows vs the butter made from grain fed cows. Butter from grass-fed cows contains much greater amounts of heart-healthy nutrients than butter from grain-fed cows. 1. Margarine is high in trans fatty acids. A study done in Boston, at the Harvard School of Public Health showed that trans-fatty acids do increase the risk of heart attack. In fact, the risk of heart attack more than doubled between those who ate the most and those who ate the least foods containing vegetable oil trans-fatty acids. The more solid a margarine is at room temperature, the more trans fat it contains, as much as 3 grams per tablespoon. Even the improved brands, such as Smart Balance, are full of artificial ingredients, synthetic vitamins which do nothing to boost your immune system (as those found in real butter do) and artificial colors because without them the products don’t appeal to customers. 2. Margarine actually contributes to heart attacks. Another study done by the Harvard School of Public Health asked people how much margarine they ate. Once the answers were recorded they waited to see what they died from. If that were not enough, margarine lowers the HDL which is the good cholesterol! 4. Margarine lowers quality of breast milk. Studies show how a mother’s eating of trans fats affects the level of trans fats in her milk. One study, for example, comparing Canadian breast milk to Chinese breast milk found that Canadian mothers had 33 more trans fats in their milk than the Chinese mothers. 5. Margarine decreases immune response. (affiliate link), consuming trans fatty acids “Affects immune response by lowering efficiency of B cell response and increasing proliferation of T cells.” This decreases the body’s immune response. So, let’s summarize the disadvantages of margarin that help us decide if margarine is good or bad. Is high in trans fatty acids. So, if margarine is actually bad for us, how did it get to be so popular? Pure and simple – money! Margarine gained popularity beginning with America’s entry into World War I when there was a shortage of fats and cost of living was high. Therefore, a cheaper alternative to the more expensive butter was quickly received by the uninformed public. Dr. Mary Enig discovered during her research that the studies linking saturated fat to heart disease were wrong. Saturated fats along with trans fats (partially hydrogenated fats) had been grouped together because of there similar chemical structure. This was done for analytical purposes. These “minor” difference, however, made all the difference in the world to the conclusion of the research. Dr. Enig found that when separated into different groups, saturated fats were found to have NO LINK to heart disease while trans fats were found to have a very strong link! Unfortunately, when Dr. Enig tried to make others aware of the mistake, she was cast out. 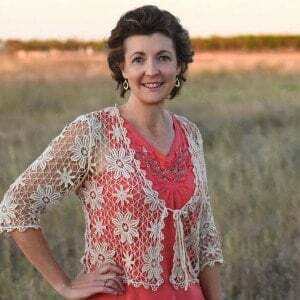 Naturally the edible oil industry whose profits she so threatened opposed her findings and she found herself unable to get grants, funding, or even a job. Fortunately for us, she has continued her research quietly and is now on the board of the Weston A. Price Foundation. What About “Heart Healthy” Substitutes? You might be tempted to compromise with heart healthy oil blends. But, think again! The word “Smart” should be taken out of Smart Balance! 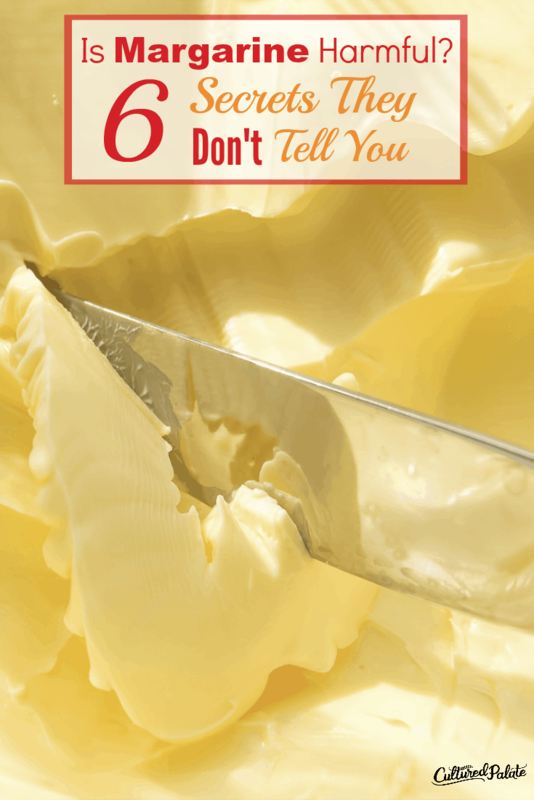 So, back to my question – is margarine harmful? Personally, I’m sticking with the natural stuff from now on! How about you? You don’t recommend using margarine, but you eat bacon? Lost all credibility with me. Lisa, there is a big difference in the quality of fat between bacon (especially when fed little to no grain) and the processed fat found in margarine. The fat in margarine is not natural and is hard for our bodies to deal with ie. vessel clogging, plaque building… I would really encourage you to continue researching! What about almond butter? Healthier or not? Juana, almond butter is healthy! Well folks, i grew up in a home where only margarine was used. Now 50 years later, me and my family still use it. No health problems at all. I feel that this margarine issue is blown right out of proporsion. I am 73 years old and i will keep on using it. Flora is my fovourite. Flora is made out of sunflower and vegetable oils. So why kick up a noise?? JJohnny, you are one of the fortunate ones that have not had problems. I hope your good health continues. Emmanuel, I am so glad – there is so much to learn about feeding our bodies in a way that helps them repair, heal and maintain health. This website has served as a confirmation to what I have always suspected. As we stand now I haven’t been consuming margarine now for the last about six months. I noticed that the consumption of margarine was related to a sharp pain that I experieced from time to time on the left side of my chest close to my heart. Since I stop, there has been no more pain. I had stopped and lapsed a few times before stopping completely, and sure enough the pain showed up. This is why I went out searching if there was anyone speaking out about margarine. Njung’e thank you for taking the time to tell of your experience! Emmanuel, you are welcome and I appreciate your taking the time to comment. Hi I live in NZ and have a problem with the ratio between good and bad cholesterol levels. I have started having olivia light margarine but am wondering now if this is a good alternative. My Dr told me once that animal fat was not good for my levels. Nellie, I am not familiar with the margarine you are talking about. I know it can be difficult especially with the genetic side of high cholesterol because there is not much you can do. But, you can make sure you are exercising and eating well. I would encourage you to look into the GAPS diet. It is not a cure all but many times, our digestive system is not functioning properly and that can cause problems. Also, having beneficial bacteria in your gut is very important to overall health. Many times, cholesterol is elevated because there is a problem – it is not the problem. It is like blaming a firefighter on sight for the fire he is trying to put out. See Cholesterol the Unsung Antioxidant.